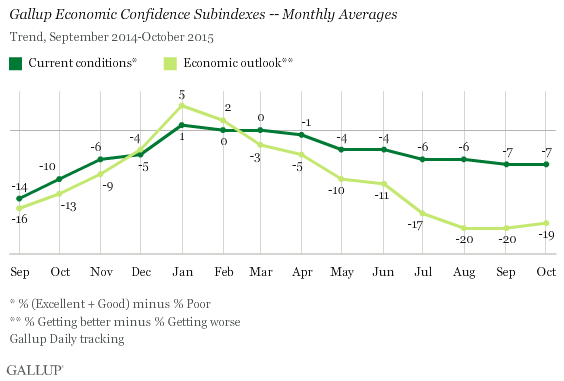 WASHINGTON, D.C. -- Gallup's Economic Confidence Index averaged -13 in October. This is essentially the same as the -14 average for September. The index has declined since peaking at +3 in January 2015, and has remained below -10 for four months. For the week of Oct. 26-Nov. 1, Gallup's weekly Economic Confidence Index averaged -15, in line with all recent estimates. 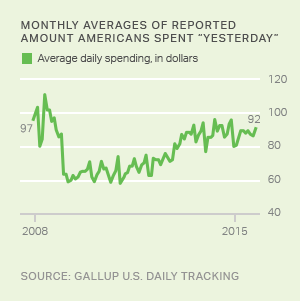 Gallup's Economic Confidence Index is the average of two components: how Americans rate current economic conditions and whether they say the economy is improving or getting worse. Since March, Americans have consistently viewed the outlook for the economy more negatively than they have viewed current economic conditions. From a broader perspective, the main cause for the decline in the index since January is the drop in Americans' economic outlook, which has fallen more steeply than their views of the current economy. Both components have been level since August. In October, 24% of Americans described current economic conditions as "excellent" or "good," while 31% rated them "poor." This resulted in a current conditions average of -7. The economic outlook average was -19 for this same period. This was the result of 38% of Americans saying the economy is "getting better" and 57% saying it is "getting worse." 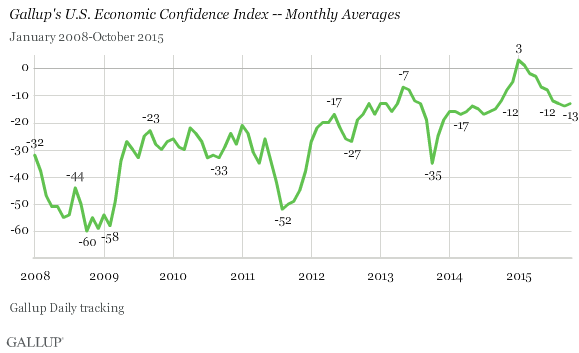 After peaking at +3 in January, the highest monthly average for the index since 2008, Gallup's Economic Confidence Index has gradually declined, reaching -13 in August and -14 in September. The -13 October average suggests the index has stabilized at its 2015 low. The rise in the index in the fall of 2014 that led up to the January high was the result of improvements in both index components. However, the decline this year has resulted mostly from deteriorating future expectations. Results for this Gallup poll are based on telephone interviews conducted Oct. 1-31, 2015, on the Gallup U.S. Daily survey, with a random sample of 15,190 adults, aged 18 and older, living in all 50 U.S. states and the District of Columbia. For results based on the total sample of national adults, the margin of sampling error is ±1 percentage point at the 95% confidence level. All reported margins of sampling error include computed design effects for weighting.